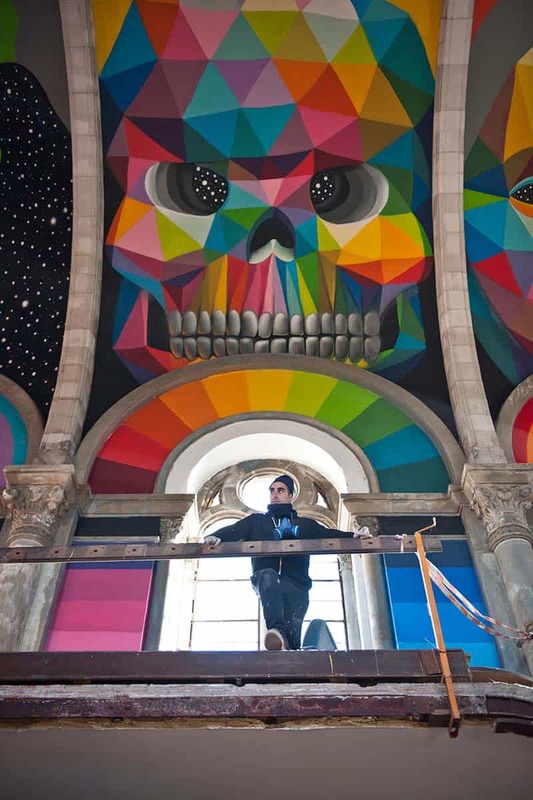 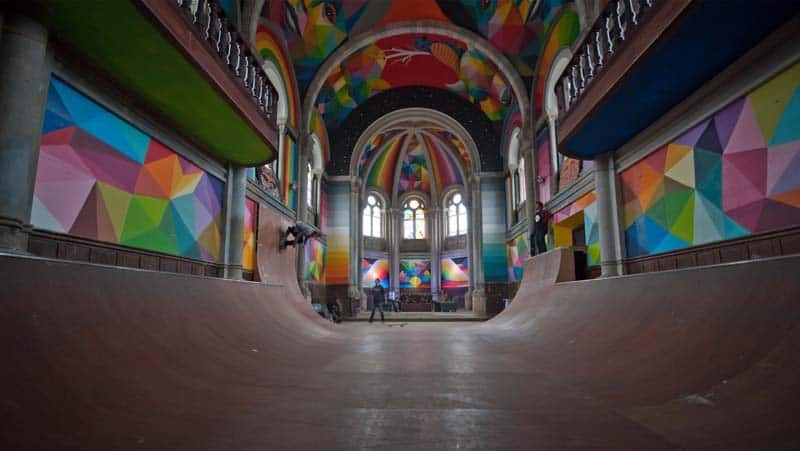 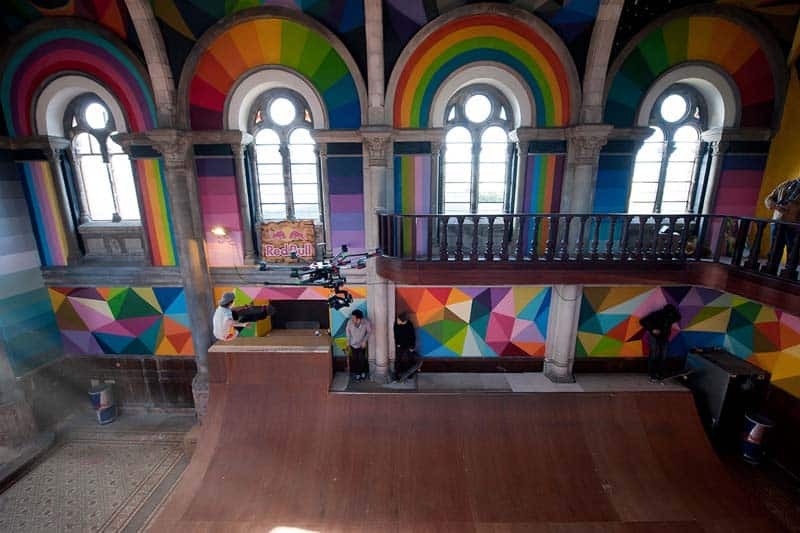 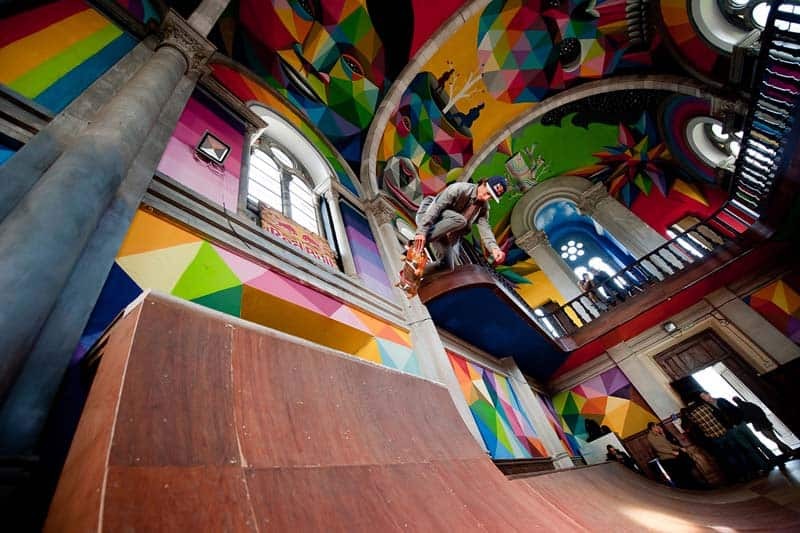 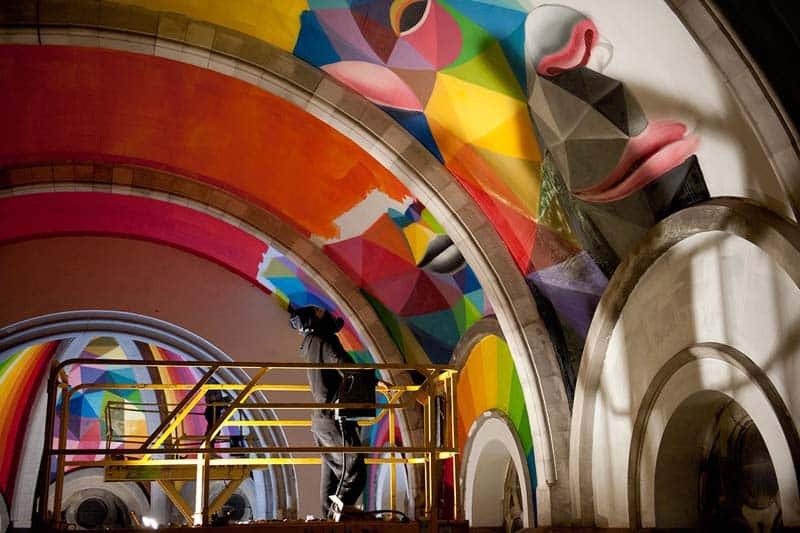 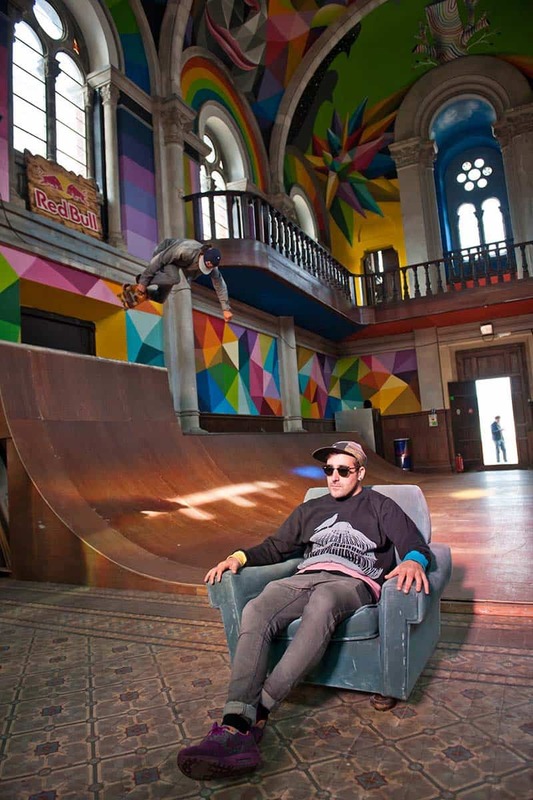 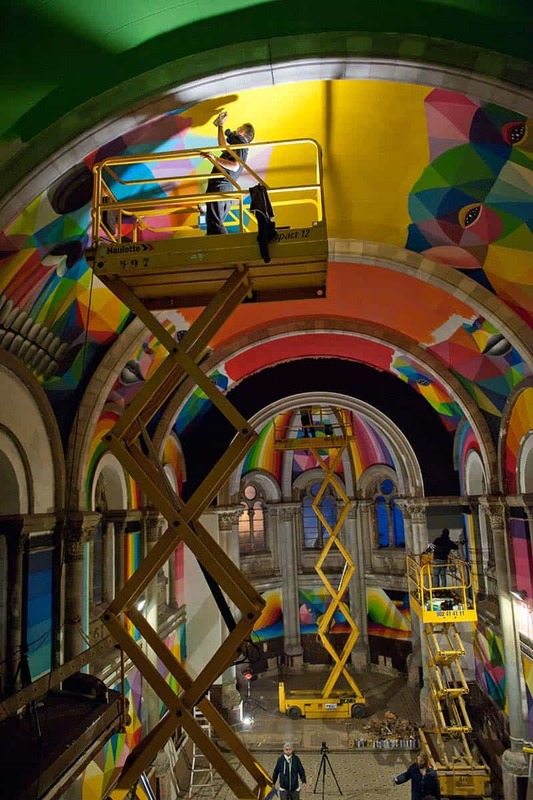 In one of his most recent works to gain worldwide recognition, Okuda San Miguel was commissioned to thoroughly cover a 100-year old church that was transformed into a skate park. 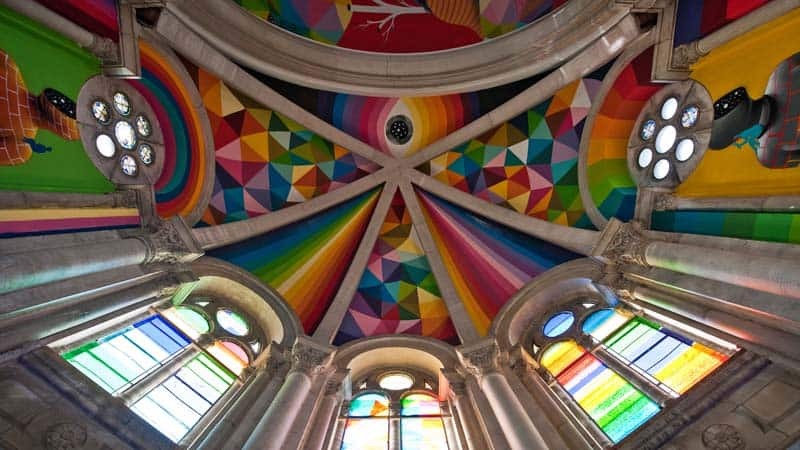 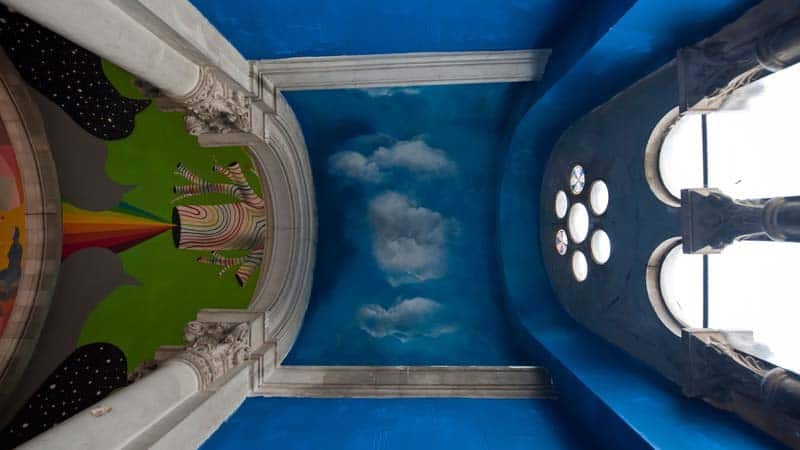 The artist’s unique brand of colorful geometric figures now covers every inch of the church walls and vaulted ceilings. 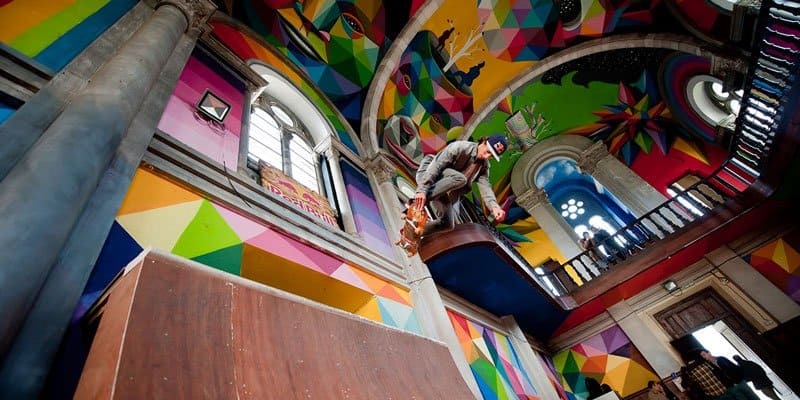 The church was originally designed by Asturian architect Manuel del Busto in 1912. 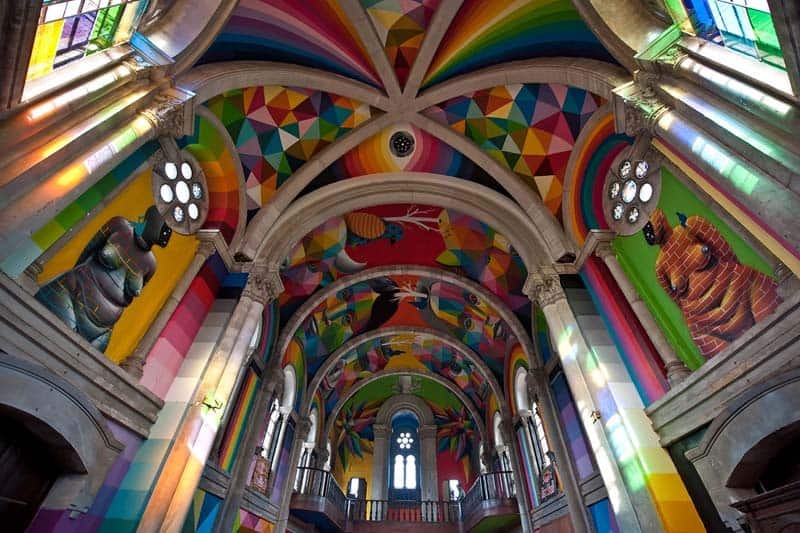 Situated in Santa Barbara in Llanera, Asturias, the church was abandoned for years and crumbling from neglect. 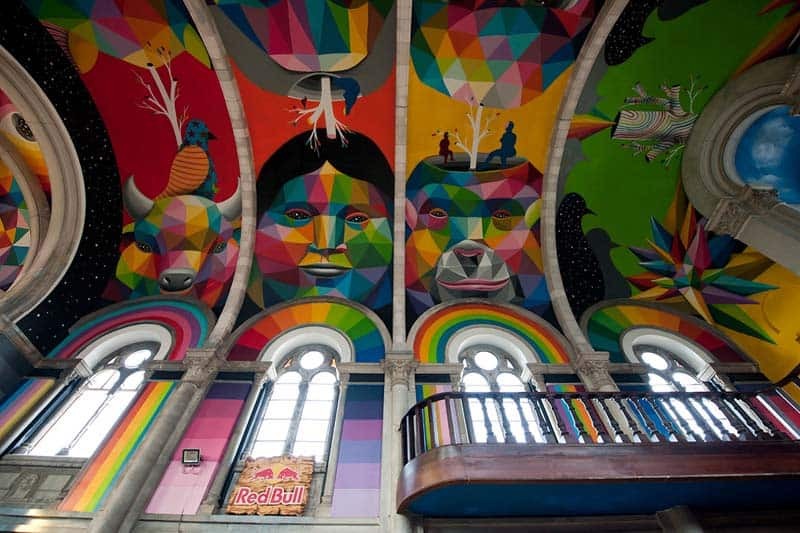 The well known street artist painted each of the building’s faces while also beautifully incorporating the structure’s windows into his designs. 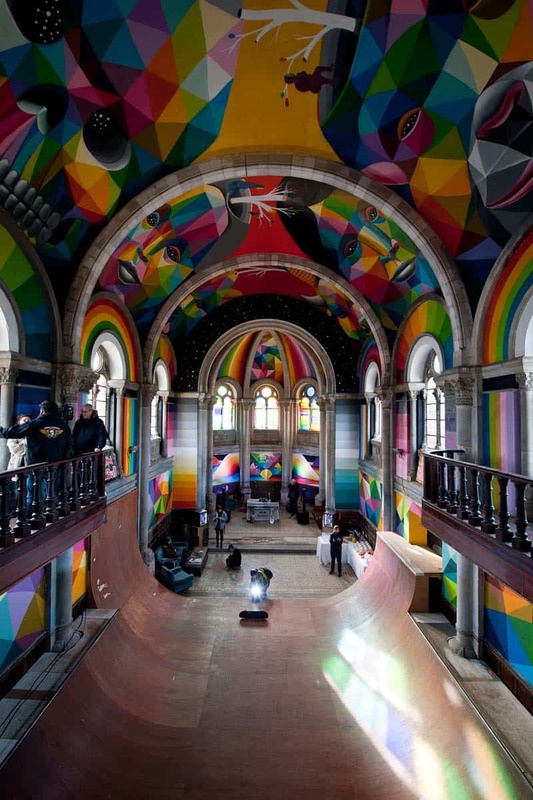 The church is painted in a vibrant hues, with smaller architectural details painted in a kaleidoscope of colors. 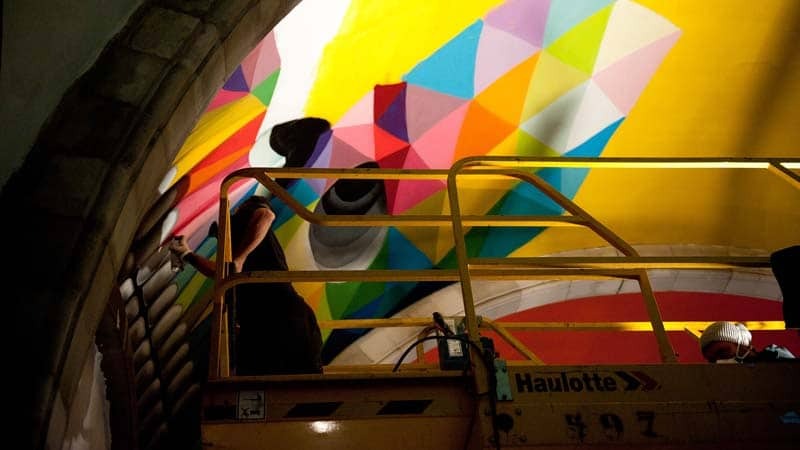 Okuda, born in Santander, Spain in 1980, is a pop surrealist street artist known for his geometric prints and multicolored organic shapes contrasted with grey figures. 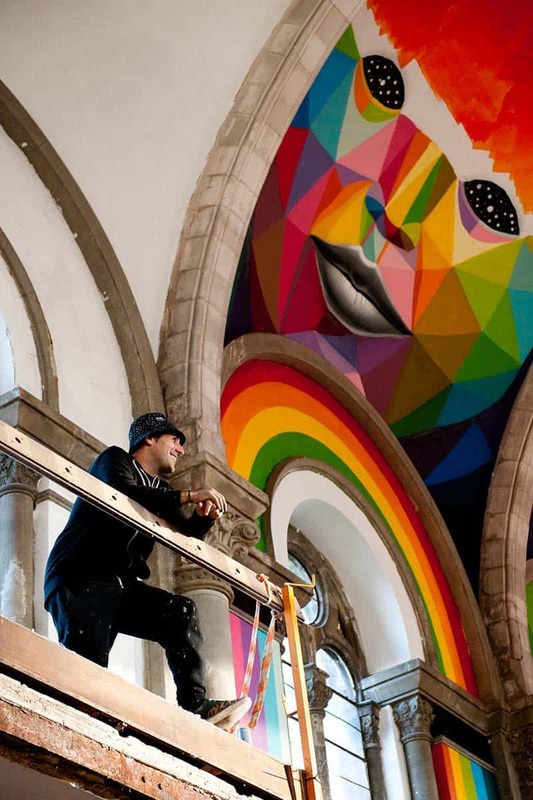 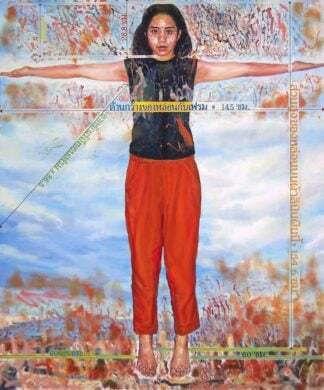 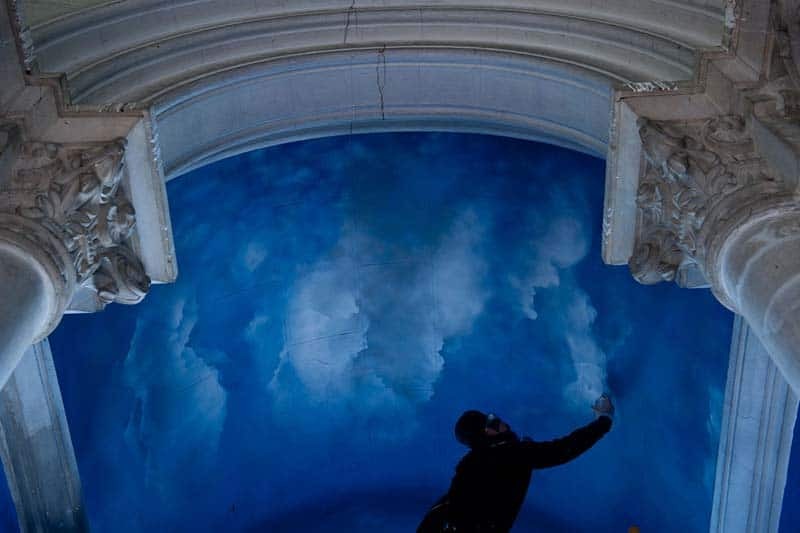 He started out his street artist career by painting old factories and railways in 1996, moving on in 2009 to do gallery exhibitions in New York City, Berlin, London and Paris, helping him gain more worldwide recognition. 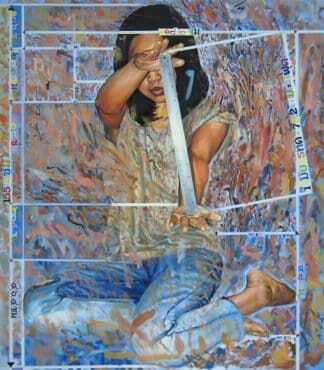 His inspiration sources include Jorodowsky, Michael Gondry, Leos Carax, and Terry Guilliam. 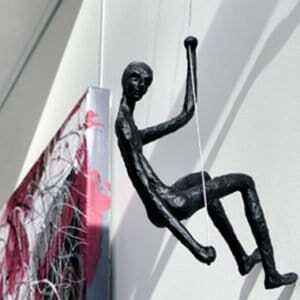 Other sources of inspiration include cinema, fashion, pop art, travel and societal issues. 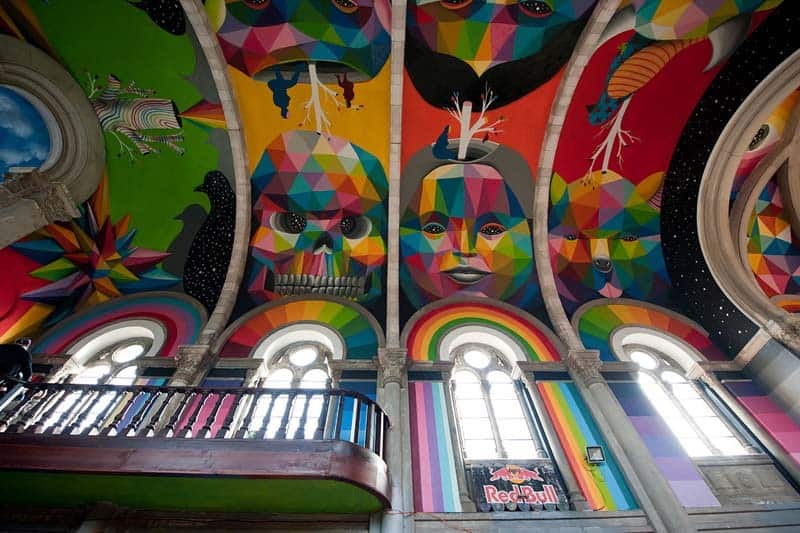 Okuda was born in Santander, Spain on November 19, 1980. 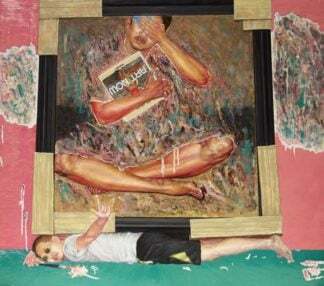 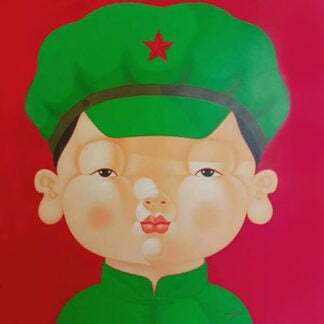 According to the artist, his pieces are intended to raise contradictions about existentialism, the universe, the infinite, the meaning of life, and the false freedom of capitalism. 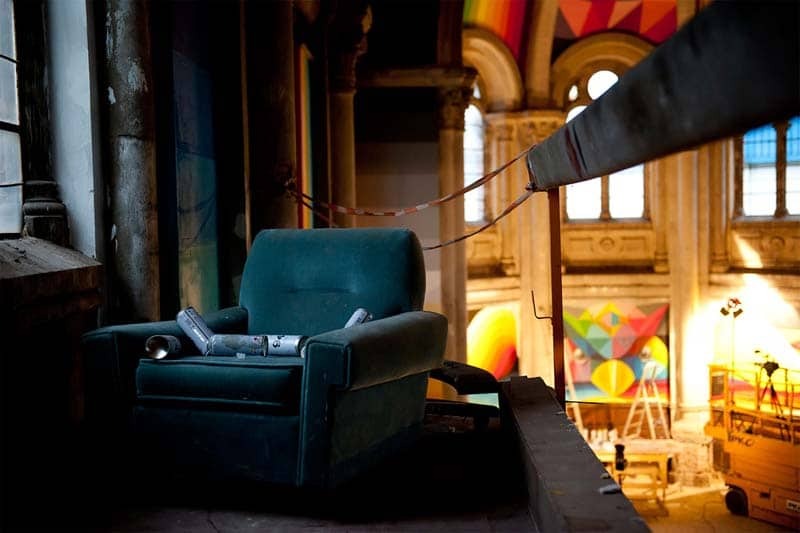 They also aim to help ignite conversations about the conflict between modernity and our roots. 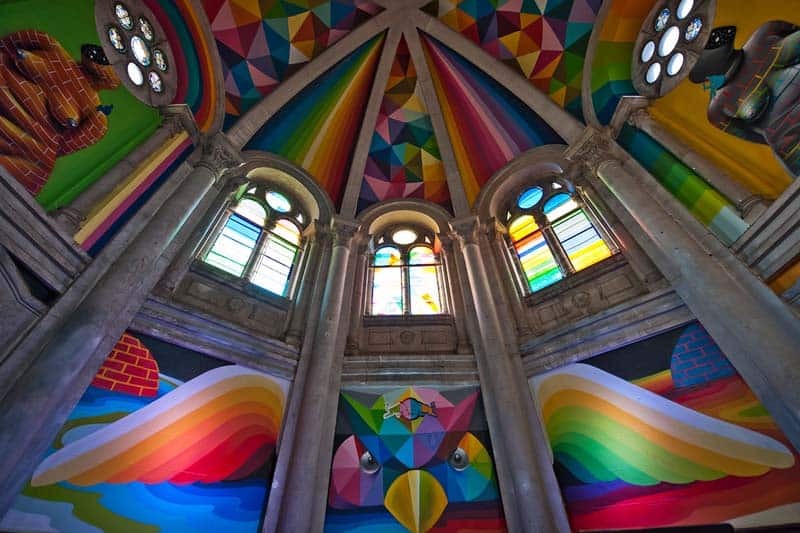 Okuda is currently based in Madrid, Spain.